quote that u're referred to by Tammy! Buon giono! The RSVP for 3rd July event in KLCC mini concourse has been brought forward to 23rd June instead of 15th June. Please send your RSVP to idi-1858@10binternational.com to attend this event at KLCC on 3rd July, 2010 mini concourse (infront of guardian). FYI I will be attending this event in the morning coz I have won a prize from IDI Italy 1858 under their Super Fan Campaign contest! 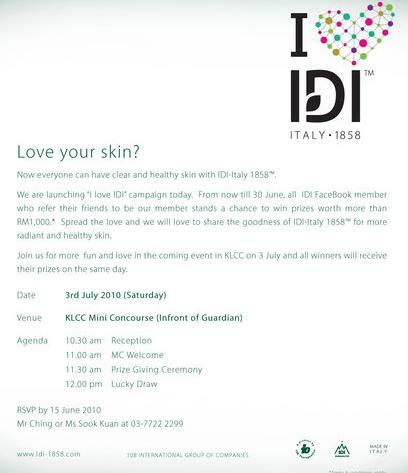 So anyone interested to attend and find out what IDI Italy 1858 Skincare is all about and maybe get a chance to join the contest to win prizes, do RSVP & join their Facebook! don't forget to say Tammy refer u! RSVP to come see Plusizekitten hehe! Give some support yah!! !